them on How Sweet It is. I knew Madison would love them since she loves rice krispy treats and she's crazy about cake batter ice cream. I decided to make them when I got home from work so that she would have them after cheerleading practice and I'm really glad I did because I found out she was hosting a small study group at our house....tonight! Teenagers give you no notice about these kind of things. What kind of food blogger would I be with no sweet treats in the house when teenagers came over?! Well they were a big hit and I will definitely make them again and again. Homemade rice krispy treats are so much better than those store bought ones and the cake batter adds an extra kick of sweetness. Make them today. They're teenager approved! Spray your bake dish with cooking spray and set aside. Melt butter in a large saucepan over low heat and add marshmallows. Stir until they begin to melt, adding cake mix one spoonful at a time so it's combined. Stir in cereal so it is completely coated with marshmallow mixture. Sprinkle in half of the sprinkles and mix. Press into a baking dish (mine was 9 x 13) and top with remaining sprinkles. Let sit for about 30 minutes before cutting. Yummy! I have to try this one I have a guy here who loves cake and Rice Krispy Treats...I'm thinking different flavors of cake mix would be fun to try! Ooooo...how about gingerbread for fall?!!! 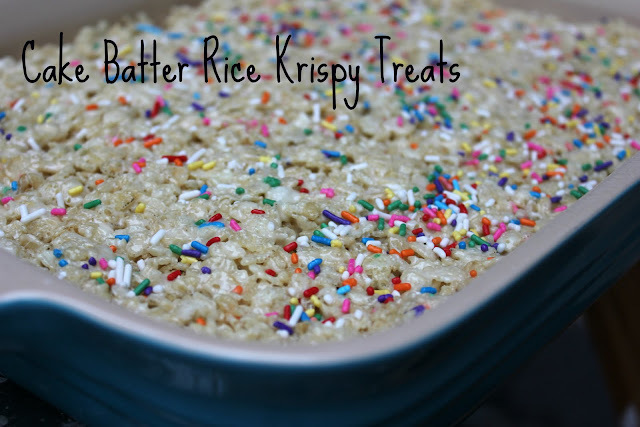 What a interesting way to use Rice Krispy Treats!! These look great! I have yet to see something on your blog that I wouldn't make :) Does the leftover cake mix keep for another time or what did you do with it?